It dawned on me that the thing I blog least about is the thing I do most. So in an attempt to set that right I thought I’d do a post on my crochet classes. We started running a Beginners’ Crochet Class in October 2016 and have completed the 13th this morning. Number 14 is already booked up to start 17th February. I can’t say the classes are routine; every group is very different and I’ve met some remarkable women over the 16 months. It makes getting up early(ish) on a Saturday morning worth while. 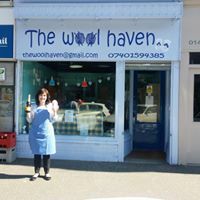 The setting for the classes is very important, the Wool Haven is a cosy yarn shop and Frances, Sandra & Eleanor all make their customers welcome. To be honest there have been a few non-class days when I’ve felt like hightailing it up there (with a crochet project) just for the atmosphere. And the yarn, they have lovely yarn as my ever-increasing stash can attest. It’s all so squishable. Ahem. back to the class. There is a layout for the 4 week classes. Working with a small group of 6 or 7 allows some degree of flexibility, hopefully enabling everyone to go at their own pace. Some things get moved forward or back depending on how people get on. Over the past year the small handout I originally provided has expanded thanks to a friend who patiently took photos while I crocheted. There’s a lot of YouTube videos out there (of varying quality) showing people how to crochet but my brain works better with step by step photographs. I’ve learnt a lot during these classes, having to think about what I do and hopefully not pass on too many bad habits. The first row is a nightmare – for EVERYONE. You will struggle until you get the hand that feeds the yarn right. And finally, there are no* new mistakes any error you might make someone has already done it. Thank you Simone. How lovely. The success and enjoyment of our classes is down to you too!